Thanks to the hard work of firefighters in the first couple days, and 20 aircraft that were dropping water and retardant over the fire, the evacuation order for the community of Midas has been lifted. Great Basin Incident Management Team arrived Monday to allow local firefighters to be able to respond to any new fires. Hand crews are actively working in the higher elevations near Six-mile ridge. They will be putting out hot spots where fire is creeping and smoldering. In lower Squaw Valley where the fire made a 20 mile run the first two days, there is little active fire remaining. Firefighters main concern today is gusty winds that may blow embers across containment lines in the Z-Road Area. A rocky bluff area that is difficult to access is holding the fire in place this morning. Firefighters will be flown in today to put the fire in check and will stay there overnight this evening. 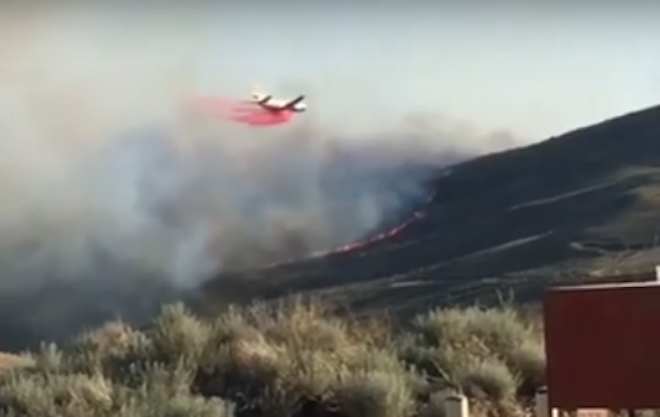 Firefighters are working to protect the greater sage brush ecosystems which are critical habitat to sage grouse and many other rangeland species. Native sagebrush/grass ecosystems are also critical to livestock grazing and local economies. Firefighters main concern today is gusty winds that may blow embers across containment lines in the Z-Road Area. A rocky bluff area that is difficult to access is holding the fire in place this morning. The Hot Pot Fire currently sits at 122,390 Acres with 5% of the perimeter contained.